If you love this pattern, Save it in your Ravlery favorites!! If you were a fan of my Rainbow Dash Baby Blanket, you will love making this fun, bright Rainbow Dash Crochet Tote Bag!! 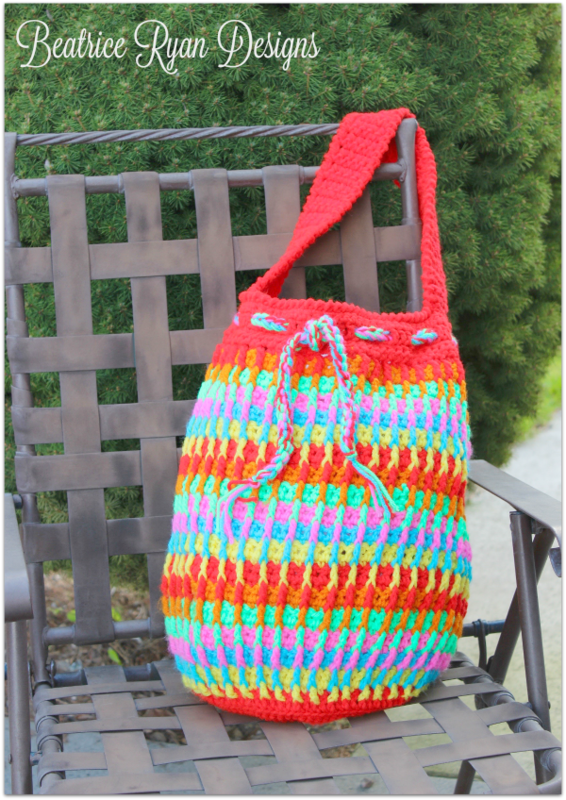 Very repetitive stitching makes this tote bag easy to make and the texture makes it pop… Great as a Market Bag, Beach Bag or Project Bag too!! 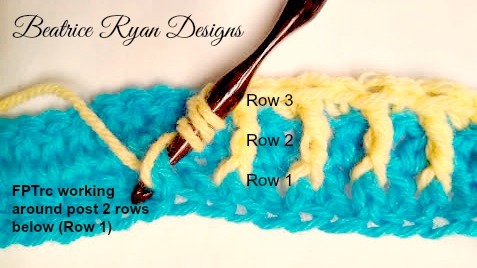 Another great feature is,,, you can use up your scrap yarn stash and make it in many different color combos!! Worsted Weight Yarn ~ Approximately 600 yards in various colors. You will need slightly more of your main color that your other color choices. I recommend using multiple colors 3+. I used Red Heart Super Saver in Glowworm, Bright Yellow, Flame, Pretty in Pink, Hot Red(My main color) and Turqua! My favorite hooks..Check out Laurel Hill! You can adjust the bag to your own sizing by changing the hook size or changing the amount of rows. 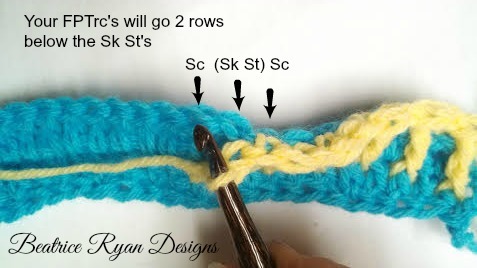 It is a 2 stitch repeat. Make a Magic Circle… Click Here for tutorial! Round 13: Ch 1, turn, sc around, join with sl st to beginning. =84 sc. *Even rounds will be the wrong side and odd rounds will be the right side. Round 14: Working in front loops, ch 3(counts as dc now and through out), turn, FLdc around. Join with sl st to top of ch 3. = 84 sts. This is the wrong side of your bag and will be the inside when complete. Round 19 -50: Repeat rounds 15 & 16 Sixteen times going around the FPTrc two rows below for round 15. Change color each repeat of rounds 15 & 16. 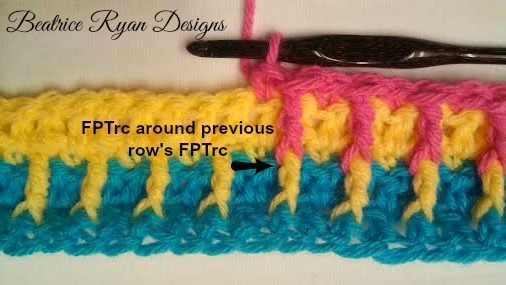 When joining the new color join in a dc from round 16 directly above a sc from round 15, this will line your stitches up so you do your FPTrc in the correct placement. Skip next 37 sts from 5th st of handle row 1, sew handle in place in next 5 sts. Leave the 2nd section of 37 sts unworked. Join main color yarn with sl st to any st in top of bag on either side of handle. Repeat on 2nd side of handle and bag. 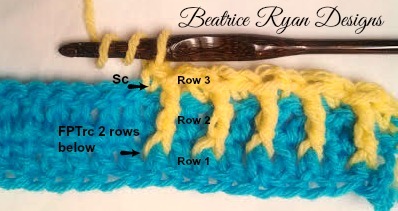 Using 4 strands of yarn (I used 4 different colors), ch a 46″ length drawstring – leaving 3″ of yarn tails at each side of drawstring. Weave drawstring in and out of ch 1 spaces of Round 52. Congratulation,,, You now have a Rainbow Dash Tote Bag!! Make sure to share your pictures of completed projects on my Facebook page!! What a beautiful pattern! Thank you for posting it. I love the bright colors! When joining do I join in the 1st SC or the beginning chain. Beautiful tote. I plan on making many different colors for family and friends.